A few weeks ago, we showed you how a new vineyard is planted. As we commented, vineyard is a crop that needs a lot of works so many tasks are carried out during a year. This time, we continue to work with new vineyard to do the first fertilizer task after planting. One of these new vineyards is near our cereal field and we could see as Florencio and his father were working. They were fertilizing with an orgnanic fertilizer (80% organic and a small part of mineral fertilizer 5-4-5). This type of fertilizer has advantages for new vineyards because plants can get it very slowly. They require a special machinery to spread it, which needs to have some pipes of large diameter to avoid obstructions (the dose used is about 2,000kg/ha). We used this type of fertilizer, e. g., for garlic before planting them. On the other hand, if you use this dose, you will have a lot of big bags so transporting tasks will be complex. In the end, almost all farmers choose manure because spreading work is easier. If it doesn't rain, they will have to irrigate after spreading this organic fertilizer (it is pellet format) to begin its dissolving under ground. Finally, farmers have to be careful with its storage because it has an intense smell and if it is wet it will begin to be compacted and farmers would have an important problem to spread it. 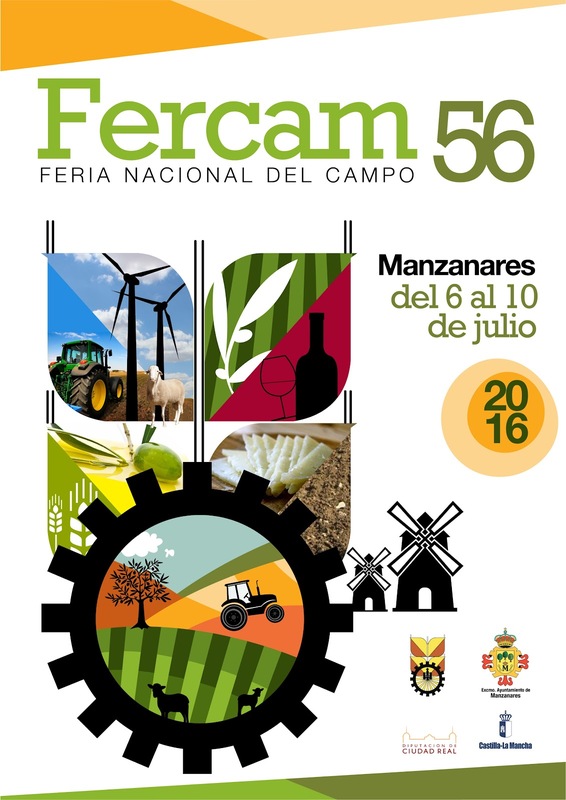 FERCAM (the National Farm Fair that is anually held in Manzanares - Ciudad Real) closed the doors of its 56th edition. The fairgrounds of 120,000 s.q.m was filled thanks yo the 184 exhibitors, they were mostly farming machinery, irrigation and food industry, along with cars and trucks, public works and renewable energy. The exposed machinery are valued over €31 million and the organization of farm fair waited a large amount of public because 175,000 invitations were distributed. In our opion, the farm fair is one of the most important in Spain and specially in South Central of Spain... definitely, we recommend visiting this fantastic show. This edition had a special attraction for us, becuase our friend Jorge Jaramillo invited us to see how they cast a radio program called "A pie de Campo" which is broadcasted on Saturday mornings and this time it was casted from farm fair (you can listen it from here)... it was a great experience for us. Jorge Jaramillo has became a benchmark for farmers in Castilla-La Mancha since his TV program called "El campo" and his radio program "A pie de campo" are broadcasted offering detailed information. Information that all farmers have to take into account for their farms regarding negotioations with administration, product prices, CAP, etc, etc, etc.